Let's take a better look at that photo. Beautiful. A great look at the wall between the grandstand and the foul area, not to mention the light standards and ads down the third base line. 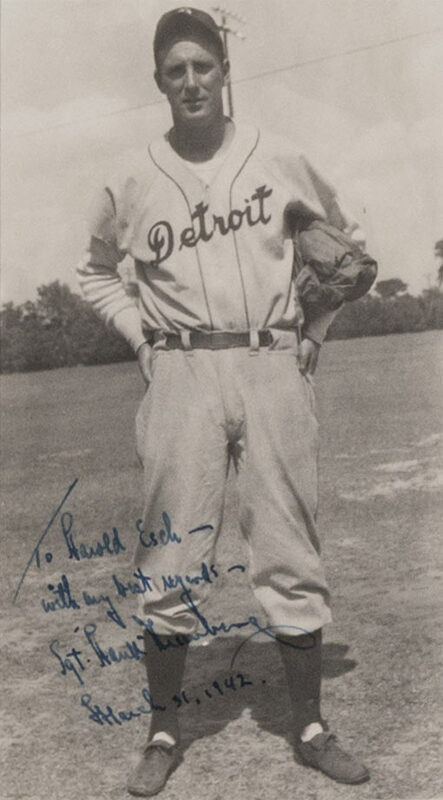 Helen Filarski was a young infielder from the east side of Detroit. 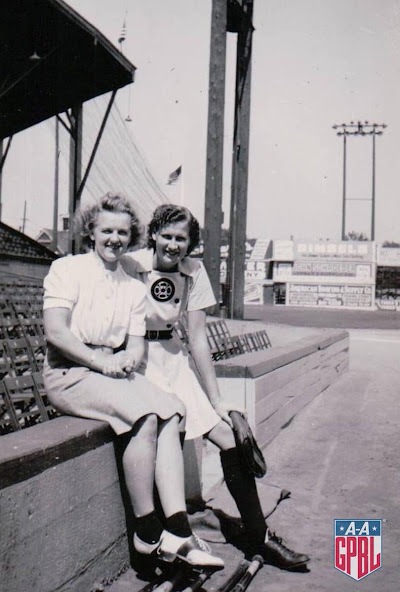 When she first heard about the league in 1943 from friends who played in her local semi-pro league, she was just eighteen and her parents forbade her to try out. 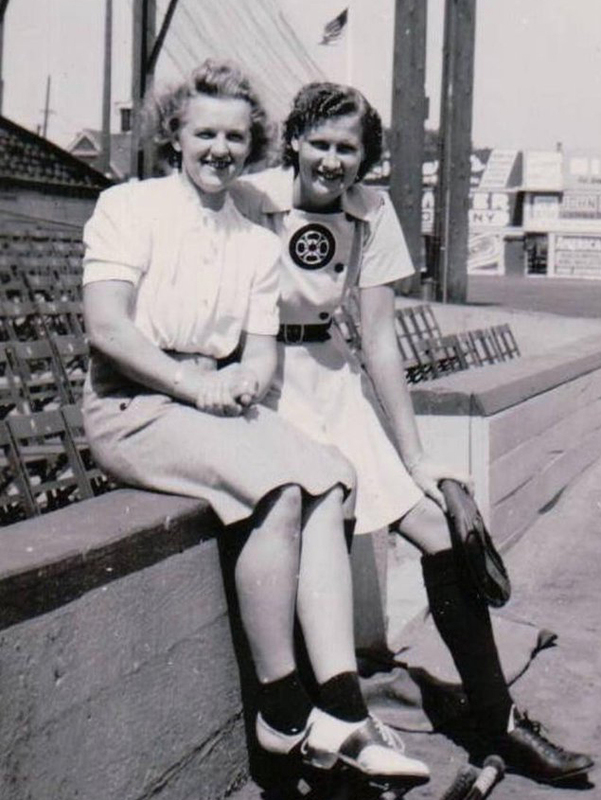 One of those friends was Milwaukee pitcher Connie Wisniewski. Filarski eventually joined the league in 1945 at a tryout in Chicago (a tryout where Wisniewski was pitching to the young recruits) and was assigned to the Rockford Peaches. Here we have Filarski presumably visiting her friend in Milwaukee. 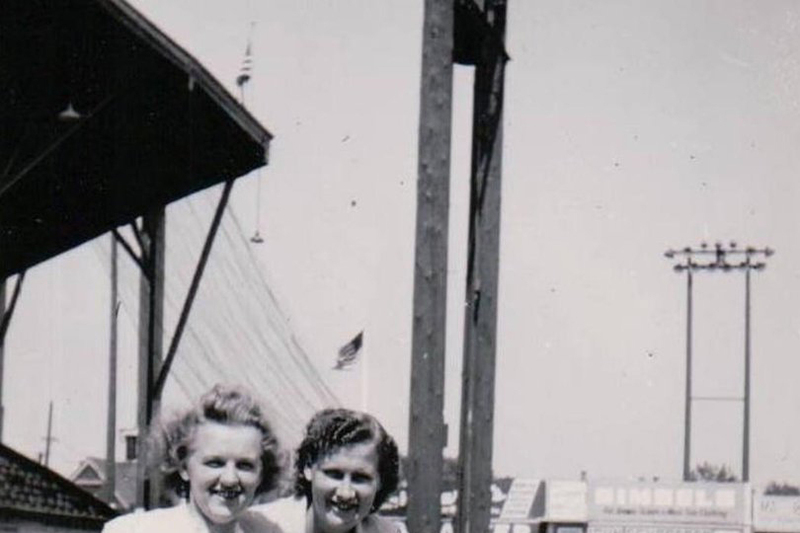 I don't know if she tried to join the league in 1944 (her own account isn't clear on the timeline); perhaps this photo was taken during a tryout session, or just a visit to see a friend. Wisniewski is wearing her uniform, with its Milwaukee city seal at the center. A bat lies at her feet. You can also see that the grandstand's lower boxes are filled with wooden folding chairs. The seats in the back, under the roof, are more traditional stadium seating. Over Wisniewski's shoulder, we get a good look at the outfield wall ads. You can also see the thick light standards installed just nine years earlier, in the foul territory between the grandstand and the diamond. Our next closeup provides a look at the roof, flagpole, and the centerfield lights in the distance. And is that a net over the left field fence to catch those short home runs? Simply magnificent. 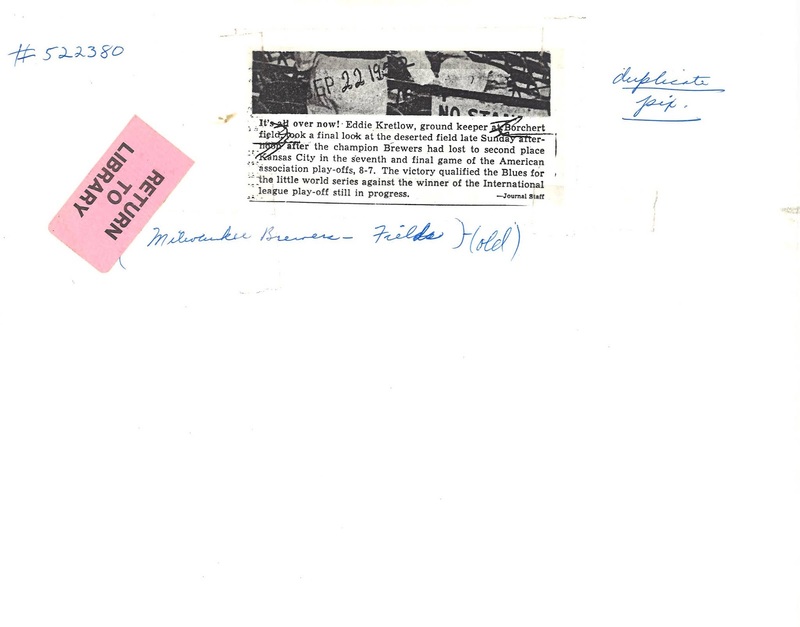 I can't wait to see what else the AAGPBL has in its archives. 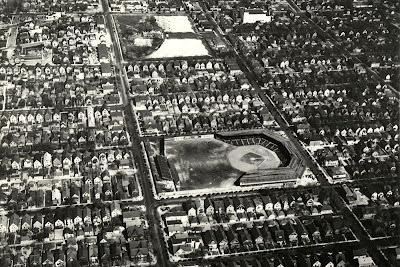 This aerial photo of Borchert Field gives us our best sense yet of how the ballpark was integrated into its neighborhood. There were taverns on the corners, but look at all those houses surrounding it. Block after residential block in every direction. With those short fences to either side, you can bet front windows were broken on 7th and 8th Streets. I don't know when this photo was taken, except that it was before permanent lights were installed in 1935. I'm also intrigued by the dirt foul area between the baselines and the grandstand. That's another element that was changed at some point during the ballpark's life. 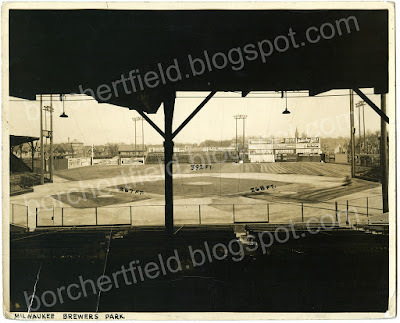 By the late 1930s there was grass planted there, the vast space filled with bullpens, pitching mounds and catching areas where pitchers would warm up. 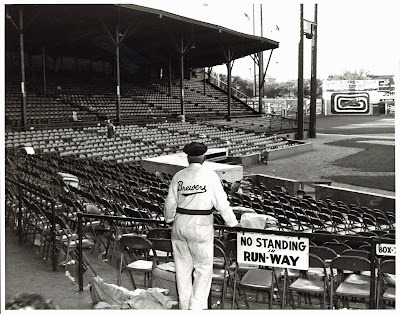 Even after the full pitching lanes had been added, there was still plenty of dirt on the warning track between the bullpens and the first row of seats. A huge space where pop flies could go to die. When all that was dirt, I wonder how much was kicked up by an August wind off the lake. Comparing this photo with a recent Google Maps satellite image, you can see that many of the nearby houses are still standing, even though the site of the ballpark itself was scooped out to make room for the sunken Interstate 43. Another reminder of how our Brewers were integrated into the community. 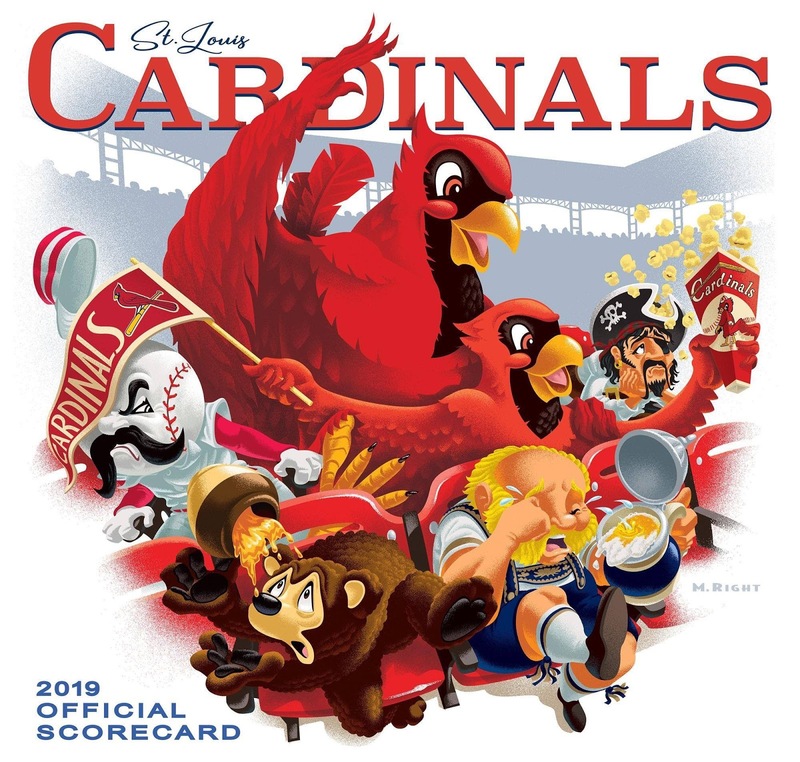 This afternoon, the Brewers will open the 2019 season in Milwaukee, taking on the St. Louis Cardinals at Miller Park. Seventy years ago next month, on Thursday, April 28, 1949, the original Brewers had their own Opening Day. 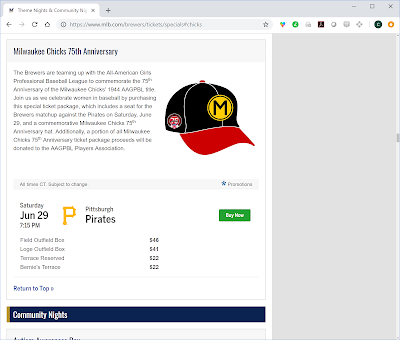 A week into the American Association season, they came home from a road trip to kick off their forty-eighth season at Borchert Field with a game against the Toledo Mud Hens. Mayor Zeidler, displaying the form of a veteran baseballer, gets ready to fire the first ball of the season just before the start of the Milwaukee-Toledo game at Borchert Field yesterday afternoon. An overflow crowd of 13,666 fans saw the Brewers pound the bases for a 9 to 1 victory. Page of pictures and game details in the Sports Section. That's pretty good form from Milwaukee Mayor Frank Zeidler. Interesting not only that he's throwing off the mound instead of from the stands, but also that he appears to have taken a full wind-up. 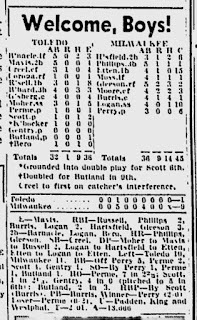 Hizzoner certainly gives the appearance of a man who really didn't want to bounce it to the catcher, but that's exactly what he did, one-hopping it to Wisconsin Governor Oscar Rennebohm behind the plate. I love the cap with suit. In the days before sports merchandising was a thing, even the caps were hard to come by and rare to see off the diamond. Well, that headline gets us off to a good start. Sadly, the reproduction of the page leaves our photo quality wanting. But even in this corrupted state, we get an excellent glimpse of our Brewers of 1949. This is an excellent shot of the Brewers' Paul Burris connecting for one of his four singles at Borchert Field yesterday against the Hens. He had a perfect day at bat and continued to lead the club at hitting. The receiver is Joe Ginsberg, a highly touted Detroit Tiger catching hopeful. Can't disagree; that is an excellent shot. A gorgeous Brewers' uniform, all navy and red, but not quite the Braves clone it would later become. There was a great roar from the crowd of 13,666 when brawny Nick Cullop, Brewer manager, moved to the microphone in the pre-game ceremonies. Brewer skipper Nick Cullop was a real character, beloved by the fans and inspiring many adjectives from newspaper writers. 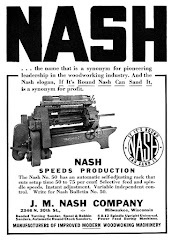 The most common one was "tomato-faced", describing his jolly, ruddy complexion, so often applied that I would expect to see it printed on his contracts. The former utility player was entering his fifth season at the helm of the Brews. The first Brewer batter, Second Baseman Roy Hartsfield, held down a safe bunt as the Cullopmen opened their home season against the Toledo Mudhens yesterday at Borchert Field. 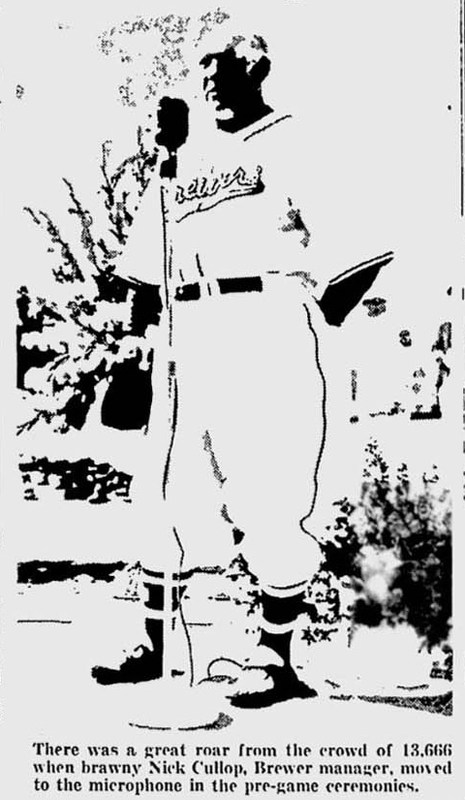 Hartsfield is shown tossing his bat aside and dashing for first base. To the right Toledo Catcher Ginsberg jerks his mask and starts for the ball (arrow). This is one where I really wish we had a better reproduction of the picture. 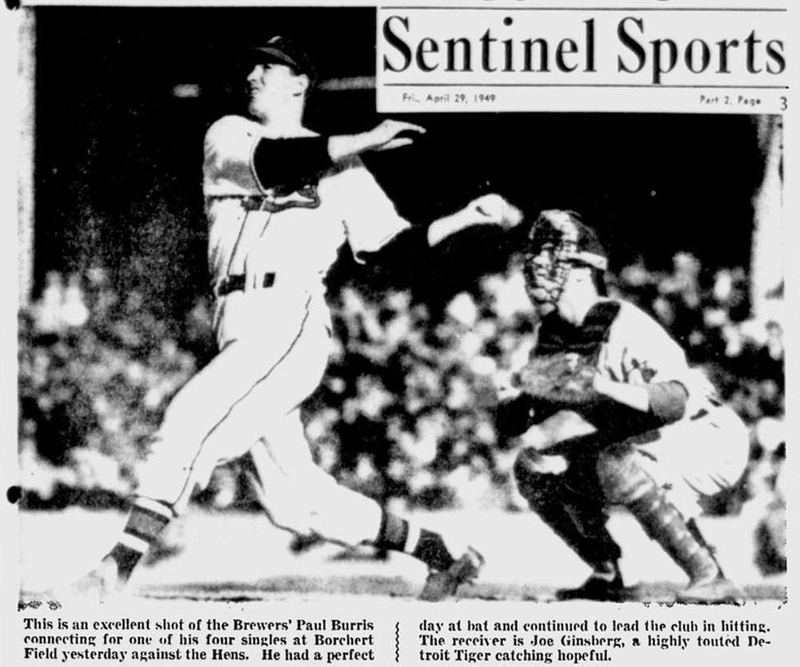 Sentinel shutterbug Frank Stanfield set up off to the side of the plate, and captured this amazing action photo. Hartsfield taking off down the line, the catcher leaping up, even the ball and arrow, highlighted against the backdrop of packed, bunting-bedecked stands. Jim Gleeson made a fine try but his aging props just couldn't get him from first to third on Paul Burris' single to left in the eighth. 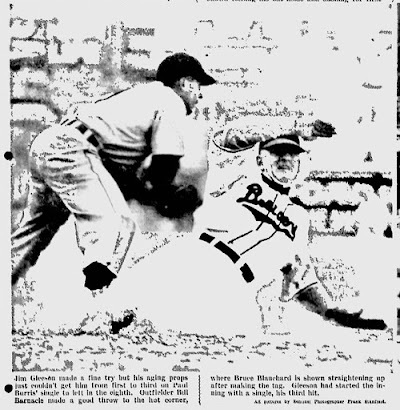 Outfielder Bill Barnacle made a good throw to the hot corner, where Bruce Blanchard is shown straightening up after making the tag. Gleeson had started the inning with a single, his third hit. Another marvelous shot that can't be ruined even by the poor reproduction. That's the large Borchert Field wall of ads in the right field corner behind them. Damon Phillips received a big hand from fans and teammates alike when he stroked the game winning homer for the Brewers in the third inning. The third sacker is greeted at the dugout. All pictures by Sentinel Photographer Frank Stanfield. Ah, an appearance by the Brewers' fantastic wool dugout jackets. ALways good to see those. The rest of the coverage is every bit as fun as the photo series. 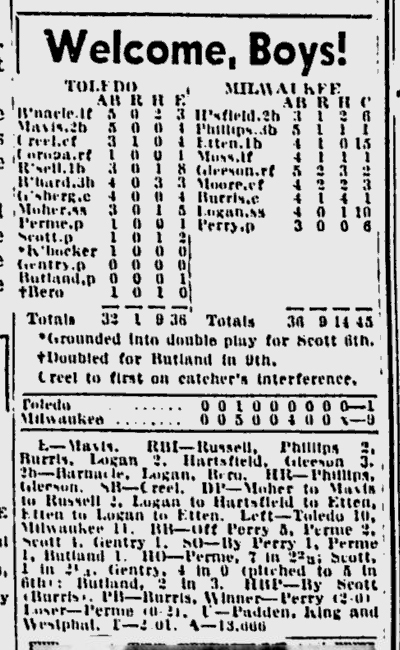 The box score tells the basic details - the game was scoreless through two, then Toledo took a temporary one-run lead in the top of the third before the Brewers stormed back with five in their half of the inning. Four more in the bottom of the sixth and the Brewers absolutely cruised to a 9-1 victory. Those dry numbers are only part of the story, of course. 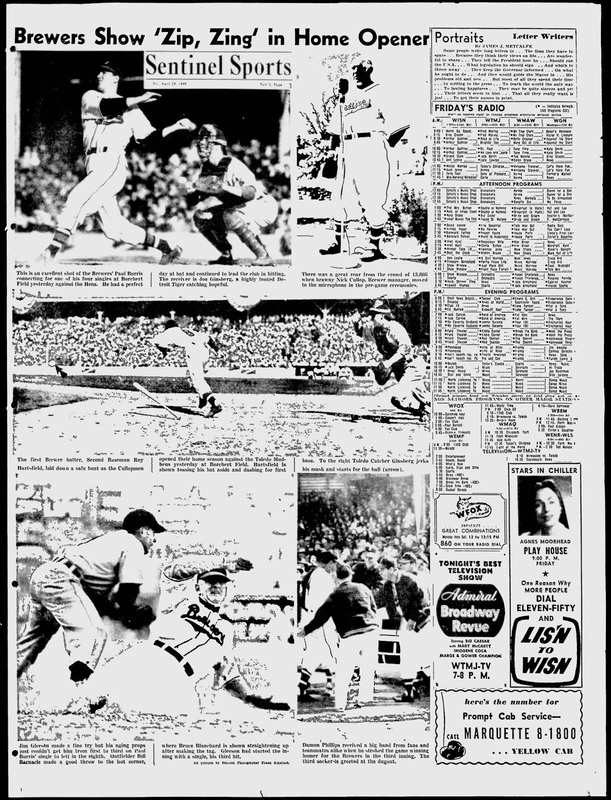 Sentinel columnist Lloyd Larson brought the game to life with his own colorful (and lengthy) recap, under the headline "'Twas a Perfect Day—The Brewers Won". I reprint it here in its entirety, because no excerpt could do it justice. It was a perfect opening day for 13,666 customers, some of whom helped open the gates at 11:30 ... Though the air was nippy, the sun was bright and reasonably warm. Pre-game ceremonies, including the speeches, were short and snappy ... And, best of all, the Brewers, old and new, looked good in winning just about as they please. Nine to one was the score ... That means the winning streak is boosted to four ... and the home club moved over the .500 hump for the first time. He's Milwaukee's outstanding mayor, but Frank Zeidler looked more like a Toledo pitcher in throwing the traditional first ball in the direction of his equally well known battery mate, Gov. 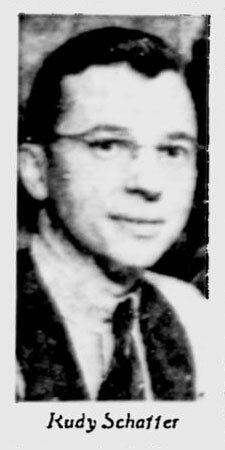 Oscar Rennebohm ... 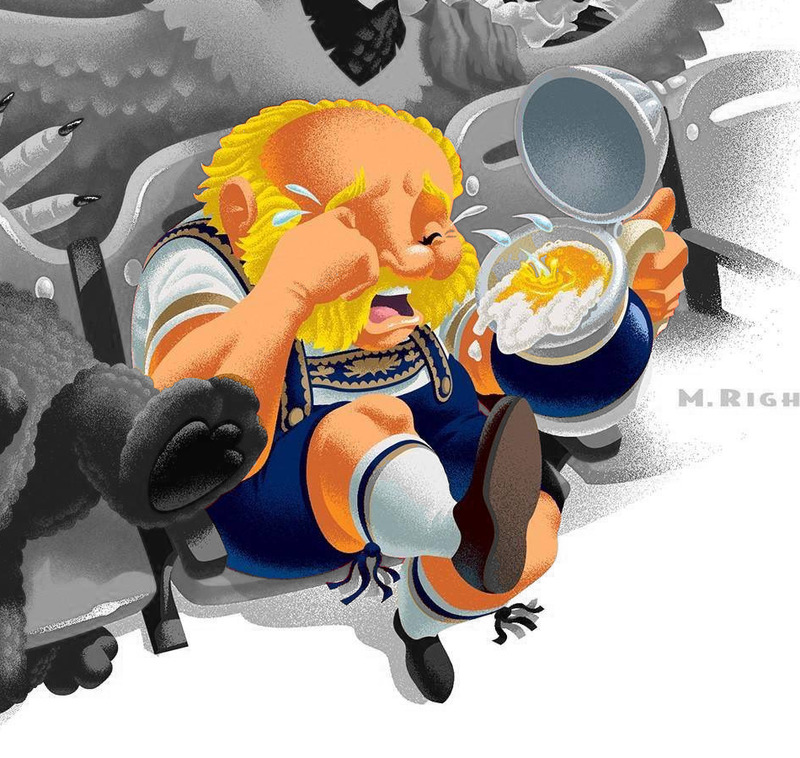 There was too much to the mayor's "downer" ... Result: The ball reached the governor on the first hop ... "We made a mistake in our preliminary warmup, "chorused the chief executives of city and state ... "We practiced at 30 feet for a 60 foot pitch," they added by way of explanation. It was all in good fun ... So everybody got a chuckle out of the act that signalized the official start of the 1949 season ... One guy who didn't get much of a whallop out of what followed was Eddie Mayo, new Toledo manager. Some nightmarish base running, which snuffed out a possible big inning in the third, was the toughest to take ... George Corona stumbled rounding second one Rip Russell's single to right and was promptly snuffed out on Jim Gleeson's throw to Johnny Logan ... A moment later Russell was cut down by the same combination after Bruce Blanchard singled ... Russell didn't stumble ... He simply dozed momentarily. Add the error which would have retired the side and cut off three Brewer runs in the third, a pop fly almost hitting a couple of outfielders on the toes, a couple of prospective outs skidding through shortstop territory for hits and lack of pitching, and it's to understand why Mayo is on his way to becoming old before his time ... 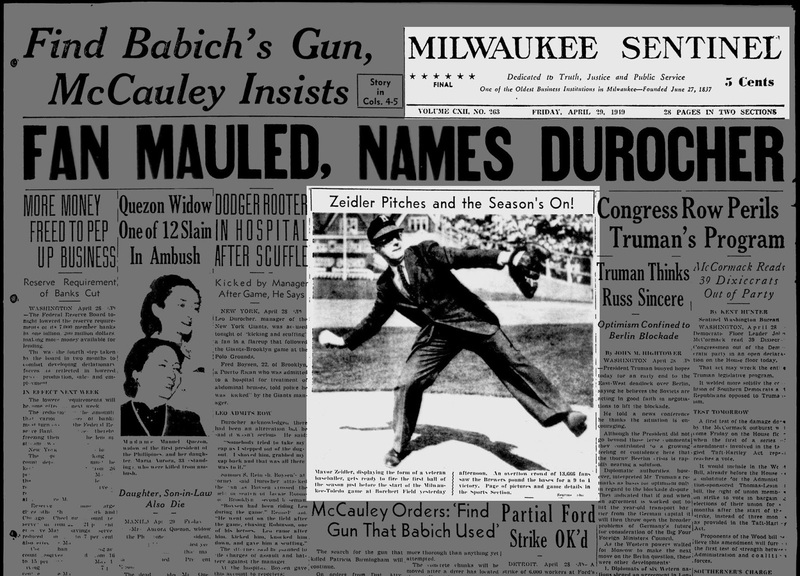 The tipoff on the pitching situation was Rufe Gentry's entry as a reliever in the sixth ... Rufe is supposed to be one of the very few starters ... He gave up four hits and a walk before Mayo gave up on him ... If it wasn't a relief, it was at least a change. Art Moher, a 1948 Ya;e graduate, obviously isn't ready for this league ... His only professional experience came late last season at Flint ... But the entire Detroit organization, including Manager Red Rolfe, sees a bright future for young Art. The one sure-fire Toledo operator is Bruce Blanchard, 23 year old former Michigan sprinter ... Boss Mayo planned to play third base himself until Blanchard took over ... Blanchard hit .328 at Williamsport to lead the Eastern League last year ... This is his third season. Roy Hartsfield lived up to advance notices, both afield and at bat ... This little guy started the big third with a single on Lefty Perme's first pitch ... The next offering may be going yet ... 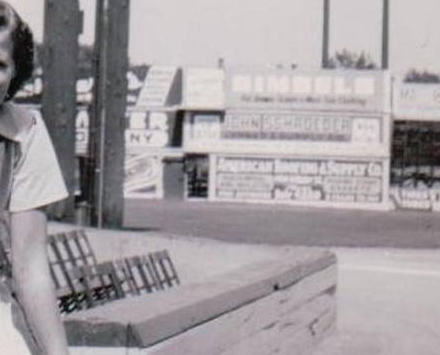 It was hit high and far over the left field fence by that popular and reliable favorite, Dee Phillips ... As things turned out, that was the ball game. Gleeson, like Phillips, is in the it-couldn't-happen-to-a-better-guy class ... And, like Phillips, he peeled off one of those big blows ... 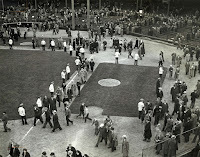 It was a drive into the bleachers with two mates aboard in the sixth ... Philips did nothing his other four times at bat, but Gleason finished with three for five. It was a complete hit day for Paul Burris ... Four times he peeled off base knocks and the other time the ball hit him on the arm ... Hartsfield and Howie Moss missed getting into the home run act bu inches ... Both showed power in belting those loud fouls over the left field wall. 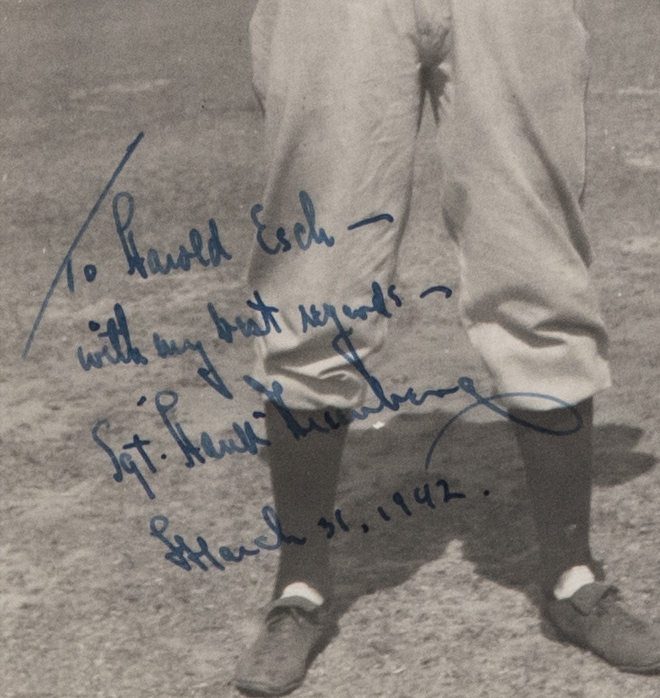 Nick Etten and Hank Perry drew up the only goose eggs in the hit column, but they more than made up for it ... Perry was a pitcher out there—definitely not a thrower ... And etten gave the folks a treat a couple of times around first ... He knocked down Creel's sizzler along the line in the seventh and completed the out with a backhand flip to Petty, who came over to cover ... In the eighth Nick started and finished a double play on Blanchard's hopper, with Johnny Logan as the middle man ... Strictly pro stuff ... After the second effort, one fan yelled: "Can you imagine Heinz Becker doing that?" ... Hardly ... The first-to-short-to-first play was a bit too tough for Heinz. 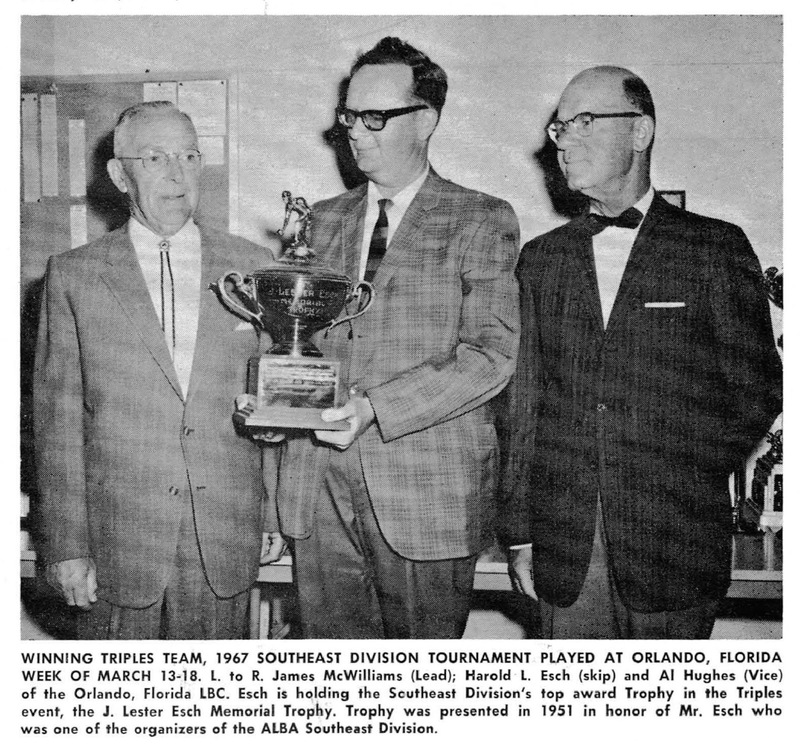 Logan and Homer Moore were off to encouraging starts ... Both fielded their positions perfectly ... Moore, whose ability to hit is in doubt, connected safely twice in four tries. George Boggs, 2953 N. 7th Street, saw his thirty-sixth consecutive opener ... And yesterday marked the start of Charlie Fichtner's thirty-sixth season as a ball club employee ... 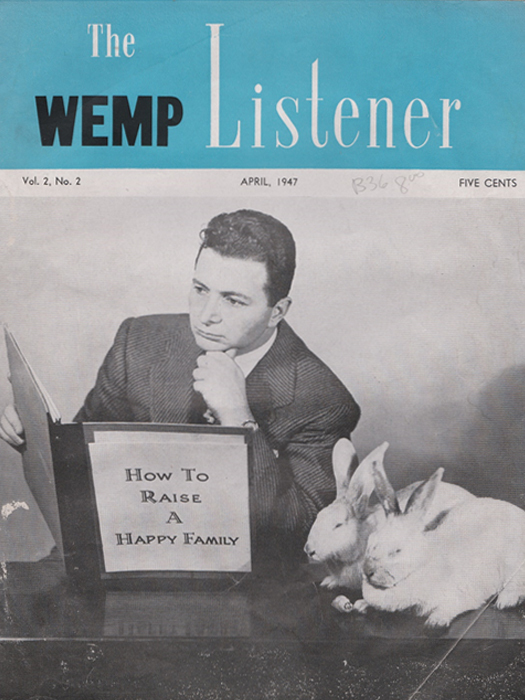 In the days before public address systems, Charlie did the announcing. Schoolboys and schoolgirls were out in force to boost the crowd total to overflow proportions ... As usual, the big majority were well-behaved ... But the inevitable handful of post-game bottle breakers, chair tippers and cushion throwers spoiled an otherwise perfect day. Magnificent, every paragraph. If Larson loses points for employing "snuffed" twice in the third paragraph, he more than makes up for it with the rhyme on "Rufe Gentry's entry" and describing Toledo's unsuccessful relief pitcher as "If it wasn't a relief, it was at least a change." I'd love to learn more about Charlie Fichtner. He's only come up once before in our studies, appearing on the field during a pregame promotion in 1934. Dressed in a suit and tie, he was identified then by the Milwaukee Journal as "Silver Lips Charlie Fichtner". If he was Borchert Field's announce before the PA was installed, I'm picturing him behind a large megaphone. Definitely need to do more research there. And with that, the Brewers' 1949 home campaign was underway. There's nothing more perfect than Opening Day. Especially when the Brewers win. 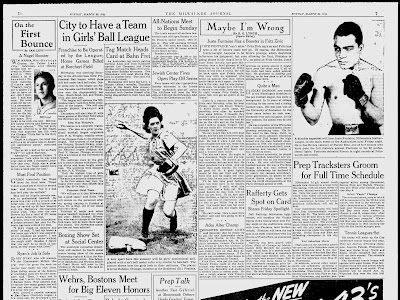 As you all know by now, 2019 is the 75th Anniversary of Milwaukee's one-year entry in the All-American Girls Professional Baseball League. And seriously, if you haven't already purchased your tickets to the commemoration event game, stop what you're doing and buy them now! 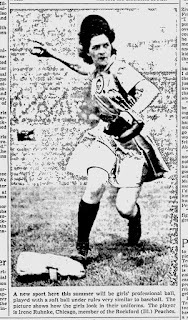 Milwaukee was admitted Saturday to the All-American Girls' Professional Ball league, which plays soft ball under hard ball rules. Other cities now in the league are Racine, Kenosha and Rockford, Ill. Racine won the championship last year. South Bend, Ind., and Toledo, Ohio, also may join. 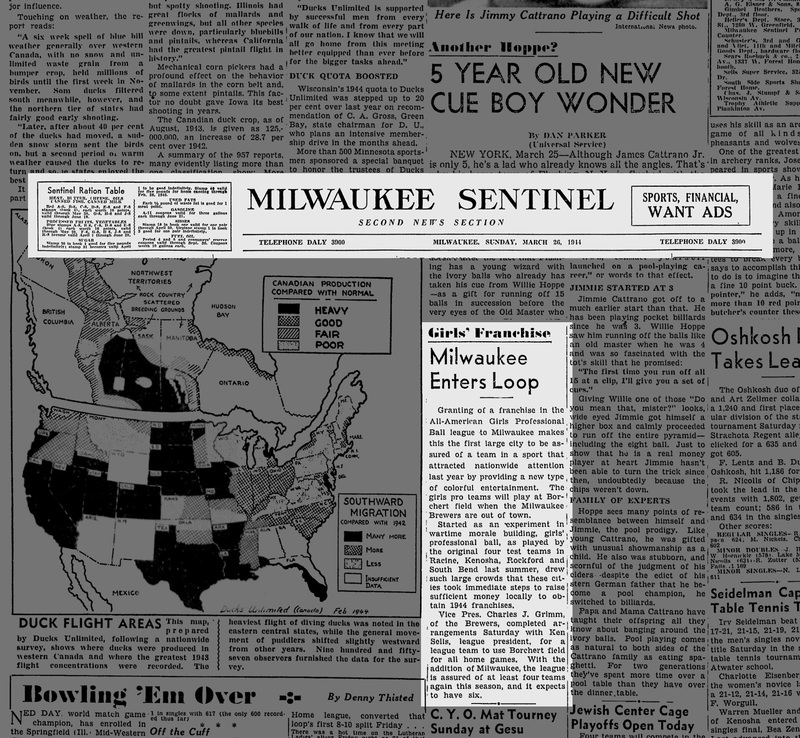 "The league will operate the Milwaukee team," said Ken Sells, president of the league. "We will also provide players, manager and coach." The season will start May 27, with home games at Borchert field when the Brewers are out of town. The league is a nonprofit organization. The idea of a girls' professional baseball league originated with P. K. Wrigley, wealthy owner of the Chicago Cubs of the National league. The trustees of the league are Wrigley, Branch Rickey, president-general manager of the Brooklyn National league Dodgers, and Paul V. Harper, Chicago attorney, who is a trustee of the University of Chicago. The uniforms worn by the girls are in pastel shades with short flaring skirts and knee length stockings. The uniforms were designed by P. K. Wrigley. "Only the highest type of girls play on our teams," said Kells here. "The girls are properly chaperoned." In its first season last year, the league drew more than 200,000 fans from May 30 to Sept. 1. "We will see to it that Milwaukee has a good team," said Kells. "We will decide on our personnel after our spring training is finished at Peru, Ill., in May. All of our teams will train there. Veterans of major and minor league baseball managed the clubs last year. 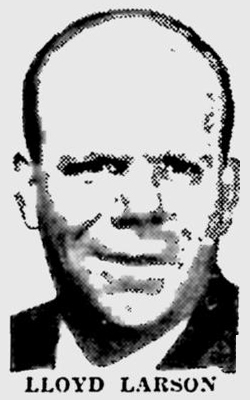 Eddie Stumpf, Milwaukee, who was in charge of the Rockford team, will be back there again this season. The Milwaukee manager has not been selected. 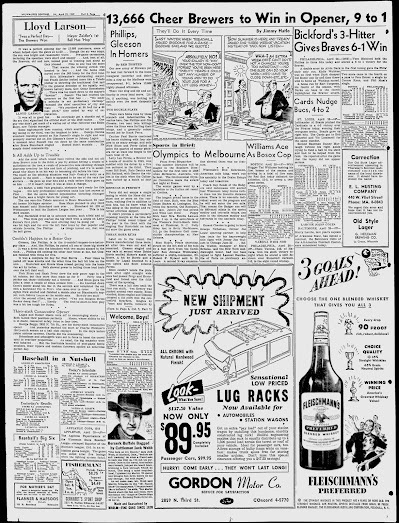 The article is mistaken about the state of the league in 1943; South Bend, Indiana didn't need to secure an expansion club, as their Blue Sox were a charter member of the league. Interesting; at this point, not only did the proposed Milwaukee team still not have a name, but they didn't yet have an expansion partner either. 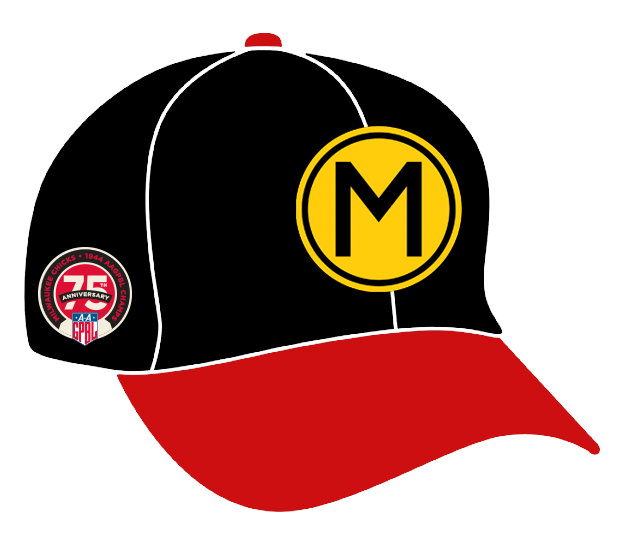 Toledo was baseball town with a club in the American Association, same as Milwaukee. 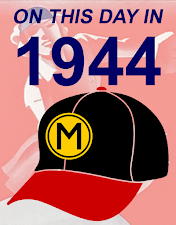 So did Minneapolis, which would eventually be the second city welcomed into the All-American League for 1944. 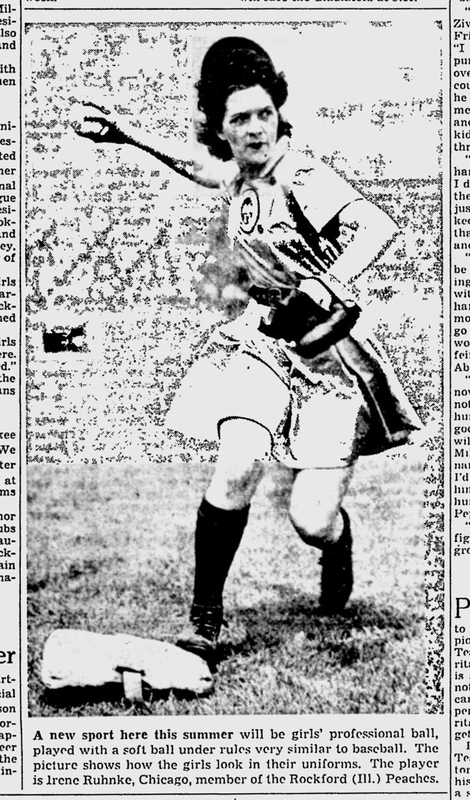 The article was accompanied by this photograph of Irene Ruhnke, wearing her Rockford Peaches uniform. Can't help but notice that Mrs. Wrigley is given all the credit for the design. 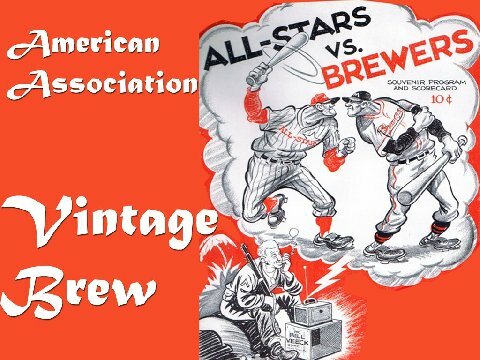 In actuality, they were a collaborative effort between Helen Wrigley, local Chicago ballplayer Ann Harnett and graphic designer Otis Shepard, who had worked for many of Wrigley's endeavors, from the Chicago Cubs to his eponymous chewing gum company. 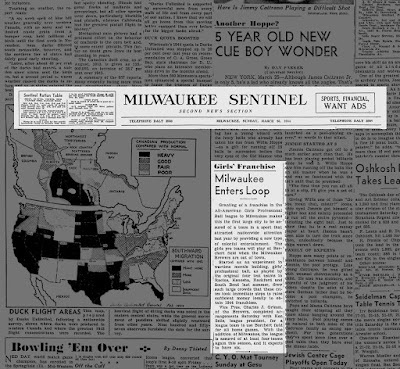 The Milwaukee Sentinel had a shorter piece, wedged on the second page of the sports section, in between a review of the previous year's duck season and a feature on a five-year-old billiards prodigy. 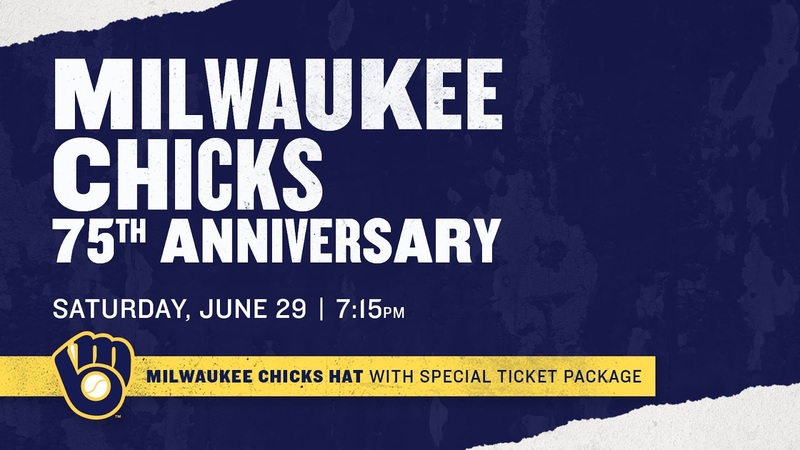 Granting of a franchise in the All=American Girls Professional Ball league to Milwaukee makes this the first large city to be assured on a team in a sport that attracted nationwide attention last year by providing a new type of colorful entertainment. The girls pro teams will play at Borchert field when the Milwaukee Brewers are out of town. Vice Pres. Charles J. Grimm, of the Brewers, completed arrangements Saturday with Ken Sells, league president, for a league team to use Borchert field for all home games. With the addition of Milwaukee, the league is assured of at least four teams again this season, and it expects to have six. But I'm getting ahead of myself. 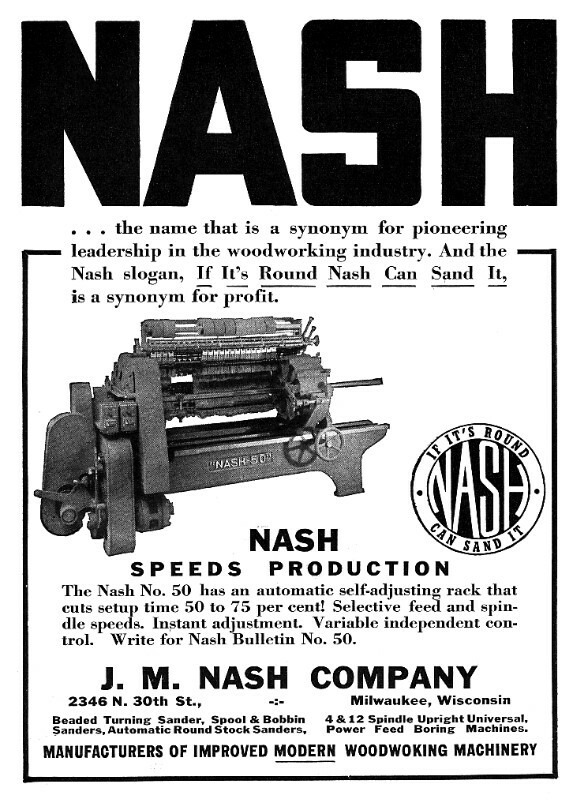 We're talking about the beginning, not the tend. And this is how it started, with these two articles in the major local papers. 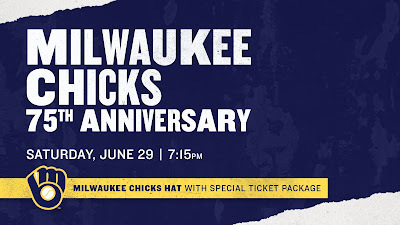 Milwaukee was officially part of the league, and the story of the Chicks had begun. Ok, I am officially tired of winter and since I can’t just sit here and complain, here’s a warm blast from the past to keep you focused on the warmer spring weather, which someone tells me is right around the corner. 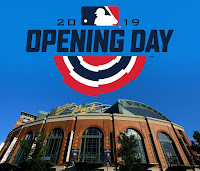 Our 2018 Central Division winning Milwaukee Brewers are in Arizona as I write this and are getting ready for the MLB season home opener on March 28, 2019 against the St. Louis Cardinals. 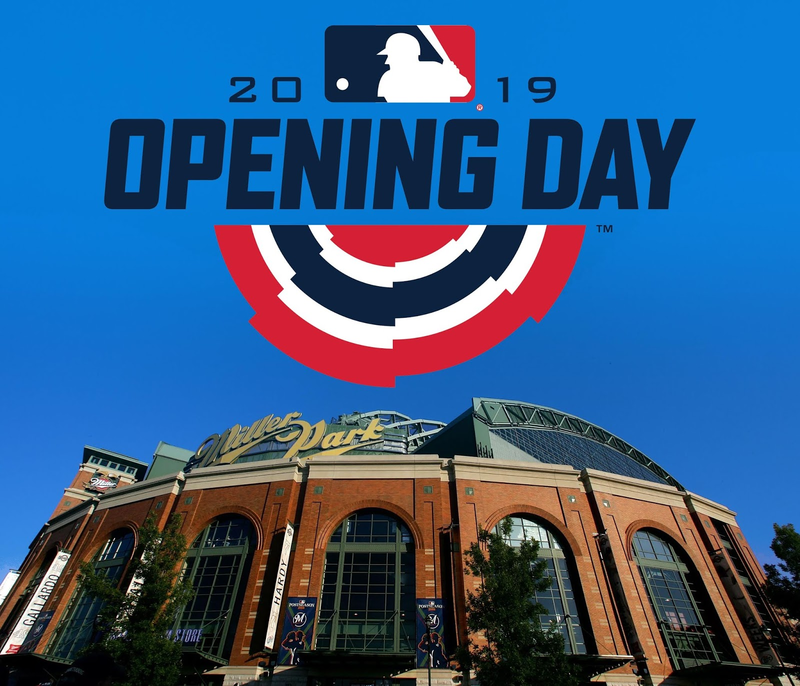 I am looking forward to being there for many games this season, as well as listening to them with Hall of Fame broadcaster Bob Uecker at the mic on WTMJ radio. The cold winter season always makes the fan’s hearts long for the green grass of home and by that, I mean … the green grass of the home ballpark. 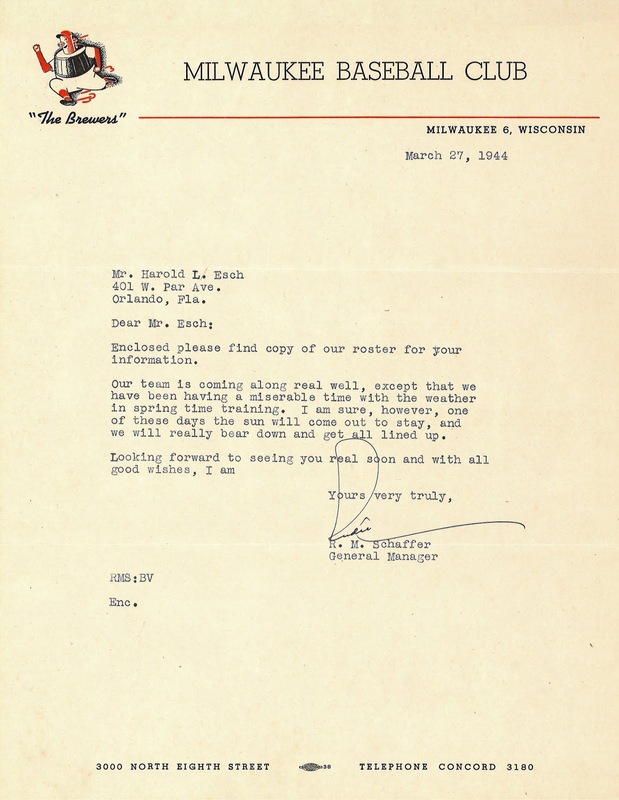 It was no different in Milwaukee as the 1947 Borchert Field Brewers were looking forward to the new season after finishing with a 70-78 record in the past year. 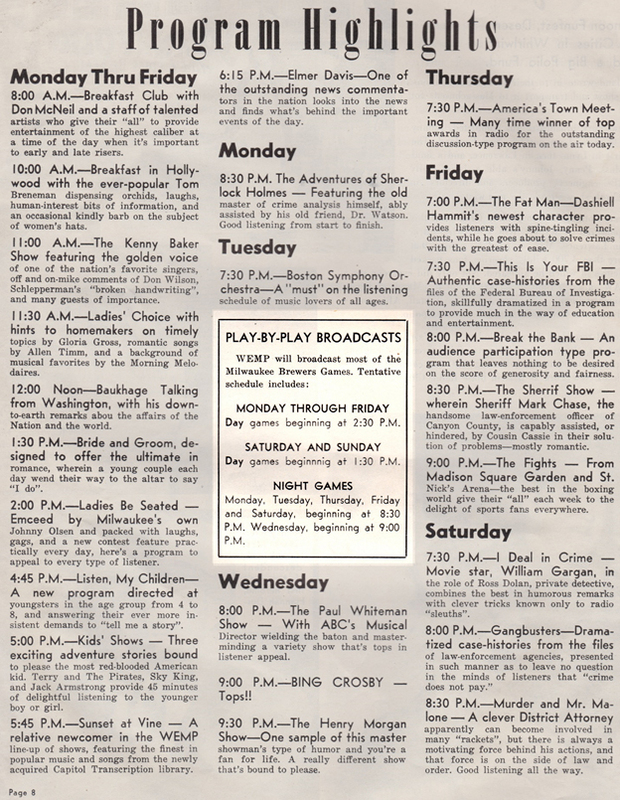 The games would be broadcast on WEMP radio. 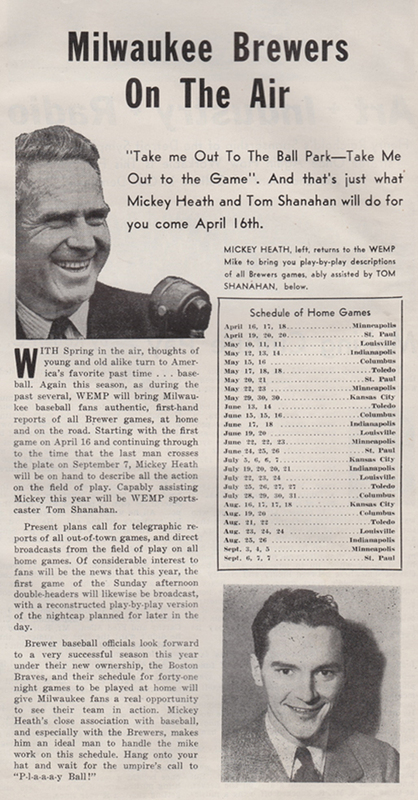 Like today, a popular former player did the play by play, Mickey Heath. 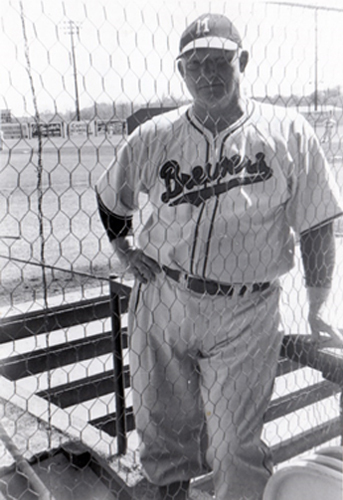 “Minor” Heath played 1st base for the Brews from 1937-1940. Brewer fans could enjoy the game either from the popular Orchard or listen in on the broadcasts. 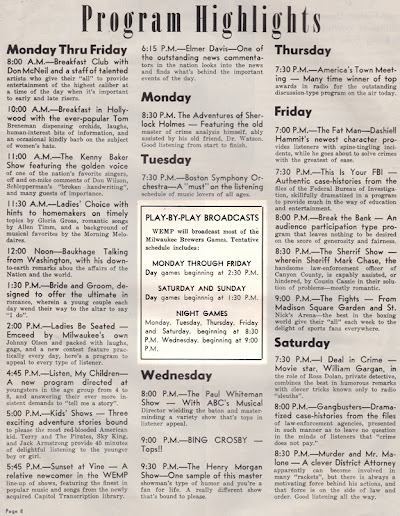 WEMP was also planning on sharing updates on away games via telegraph. 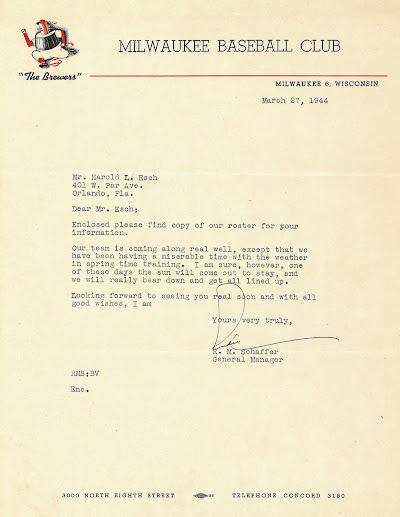 1947 would be a better year under the new ownership of the Boston Braves. The team improved their record to 79-75, finishing 3rd in the American Association under Nick Cullop. Good enough to gain a spot in the playoffs, they took advantage of the opportunity and went on to win it all. After besting the Kansas City Blue 4 games to 2, they beat the Louisville Colonels in the finals 4-3. The Brewers defeated the Syracuse Chiefs of the International League in the Junior World Series 4 games to 3. Looking at that photo from Borchert Field's last-ever game got me thinking. I was wondering how the outfield ads changed over time, specifically those in the left field corner, since it's featured in our 1952 photo. 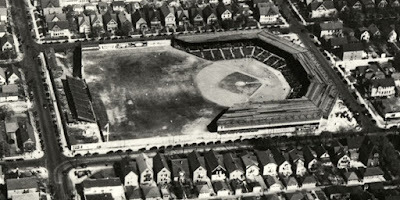 We don't have many photos showing the left-field corner, but we have a couple. We can compare them and see how that's changed over time. 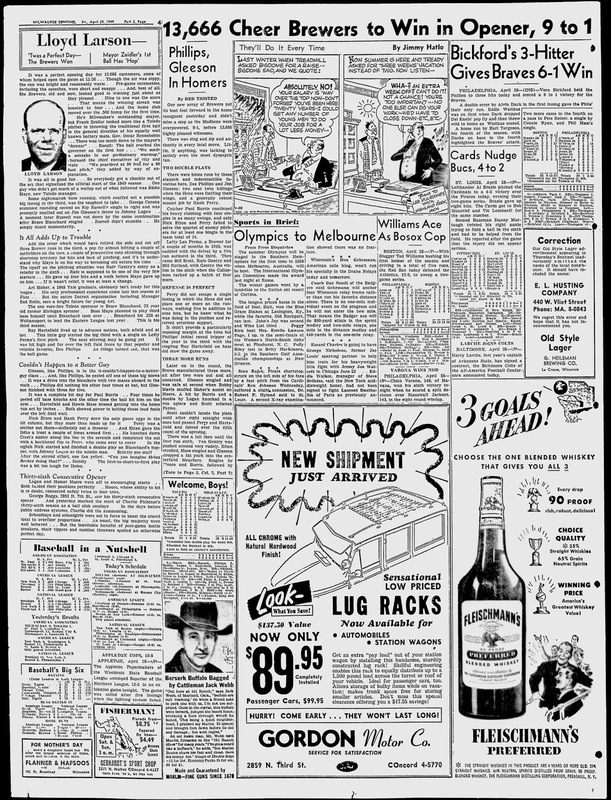 Same basic ad in this photo circa 1948, but all the details are different. Somewhere along the line it seems to have lost its tagline "A really good caramal bar". And even if the basic advertiser was the same, the ads to its left, along the 8th Street wall, were all different between 1948 and 1952. 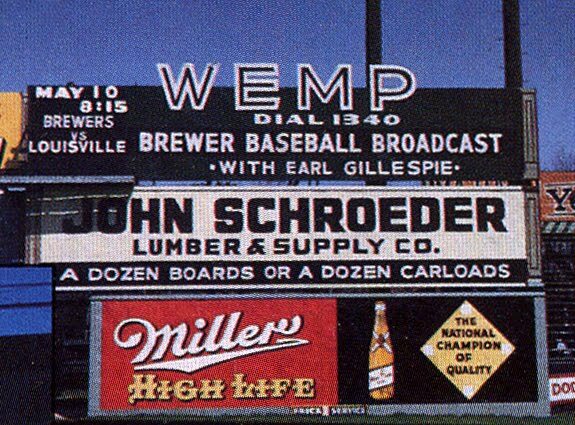 On the other hand, we can see to the right pieces of ads for WEMP, John Schroeder lumber yards, and the Miller Brewing Company, all of which feature in this rare color photo of the ballpark. You can see that the wall was really built up during that decade. 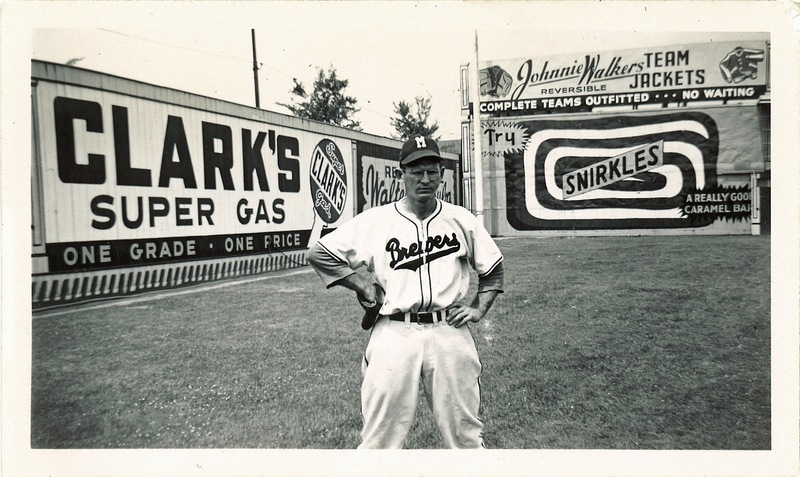 So we know the Snirkles ad came about in the mid-to-late-1940s and remained until the ballpark's final year. And that just about everything around it was in a constant state of change, which may be expected. 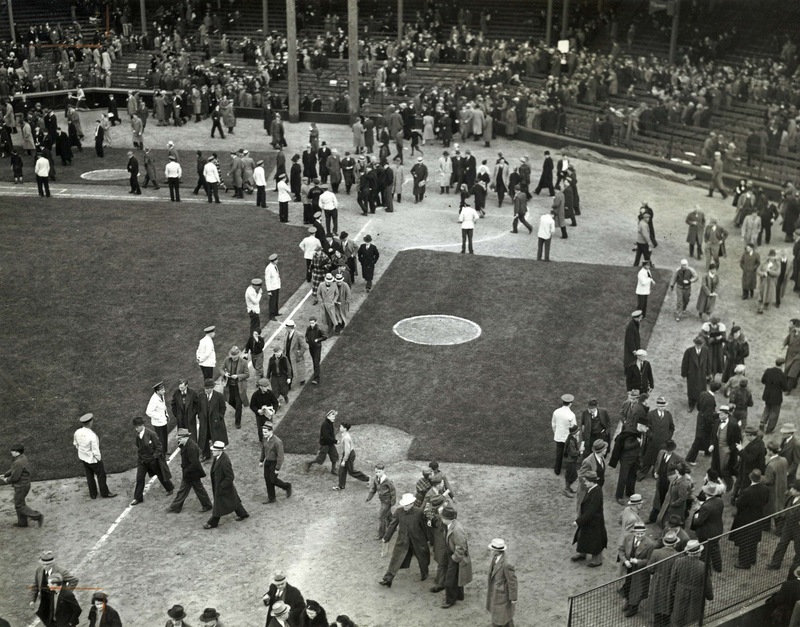 There isn't a ton of photographic reference of the old wooden ballpark, but I'll take any opportunity to piece together its history. Hope we get more of this. We've seen this photo before—it was one of the first pictures I ever posted, a decade ago when this site was new—but never quite like this. It's all over now! Eddie Kretlow, ground keeper at Borchert field took a final look at the deserte field late Sunday afternoon after the champion Brewers had lost to second place Kansas City in the seventh and final game of the American association play-offs, 8-7. The victory qualified the Blues for the little world series against the winner of the International league play-off still in progress. I had certainly seen this picture before, but always devoid of any context. 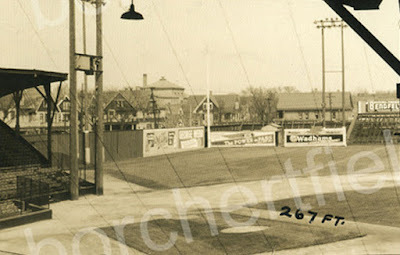 Now we know that it was taken after the final game at Borchert field, with the Brewers scheduled to move into the almost-ready County Stadium the following spring. I was right about the feeling of melancholy, although I mistook the groundskeeper for an usher. It's interesting to me that they were still using the 1940s logo several years after it had been replaced on the uniforms. 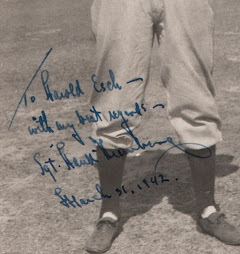 Then again, Edward Kretlow had been the Orchard's groundskeeper since at least the 1930s (we previously saw him oiling turnstyles before the 1947 opener), so it's possible he'd been wearing it all that time. And understanding the long connection he had with the ballpark, a sense of melancholy at its final game seems more than reasonable. So much to love about this picture. And so glad we finally know more about it.